My preferred mode of transportation along the coast is my Vespa 250, followed by my Yamaha C3. But there is another, and more romantic, way to visit the glorious coast of Maine. Imagine sailing just a few hundred yards off the rocky coast in the twilight of a perfect summer day. You and your wife, husband, lover (pick just one - let's not get carried away) have just finished a meal of very fresh fish hauled aboard just as the grill was ready for broiling. Now, in the orange gleam of the setting sun, you guide your craft to its mooring, and the real fun begins as you ride home on your scooter. 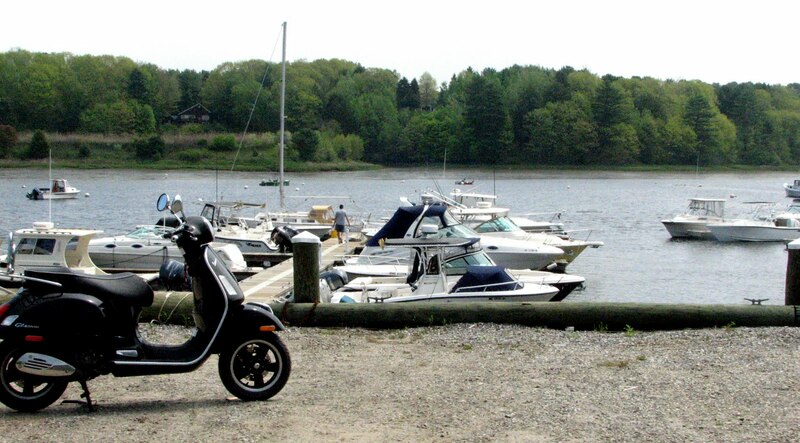 Below is one place to begin such a journey - Yarmouth Boat Yard, on the Royal River in Yarmouth, Maine. 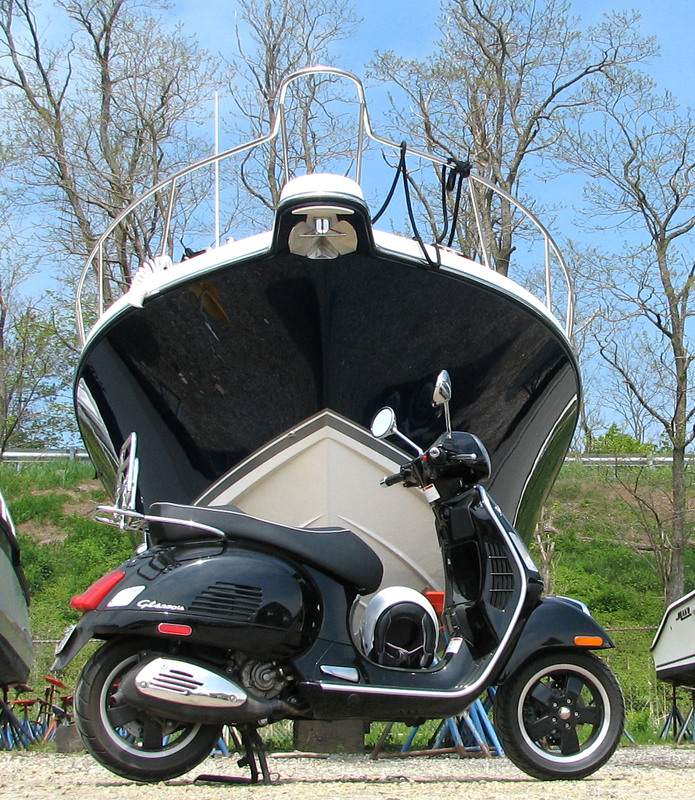 Owner Steve Arnold said that the Pursuit 375 Offshore which dwarfs my Vespa in both size and price, sells for $550,000. For that, one could buy about 91 250 i.e. Supers. And while the Pursuit gulps 38 gallons of gas at a cruising speed of just over 33 mph, my 250 sips 2 gallons as it travels 125 miles at about 45 mph. 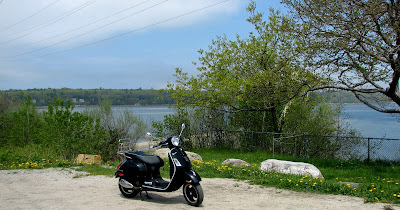 On the other hand, I can't fish, sleep, cook, entertain guests, stretch my old muscles, sunbathe, or dive from the Vespa. Below is a comparison of power units. The 250 pumps out about 22 horsepower and weighs 325 pounds. 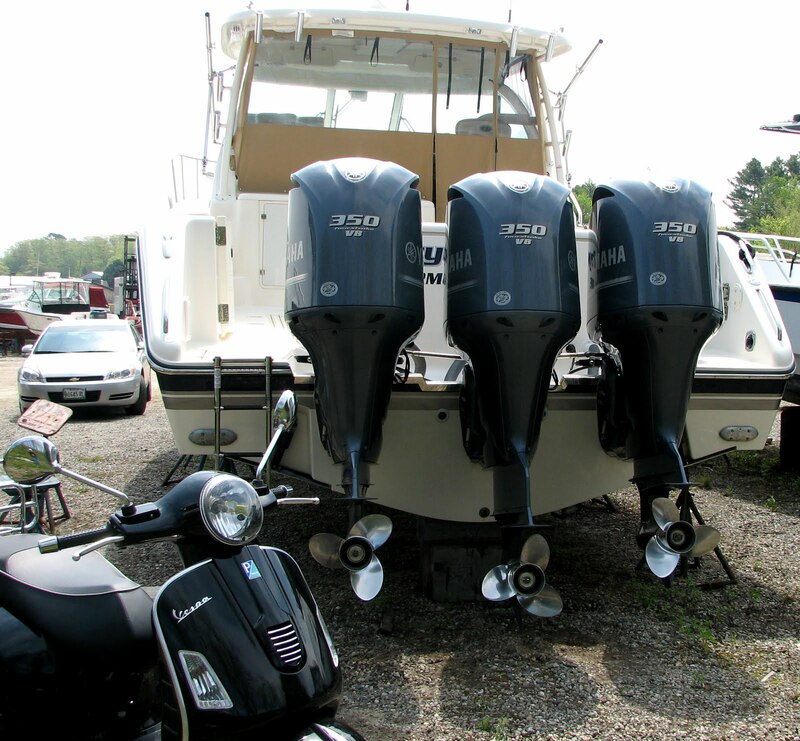 Each of the three Yamaha outboard V-8 motors weighs 804 pounds and produces 350 horsepower. You can visit the Pursuit and a marina of very nice boats (I've never understood when a boat becomes a ship, but the huge, nearly 40-foot-long Pursuit 375 has got to be close to shipdom) at yarmouthboatyard.com. 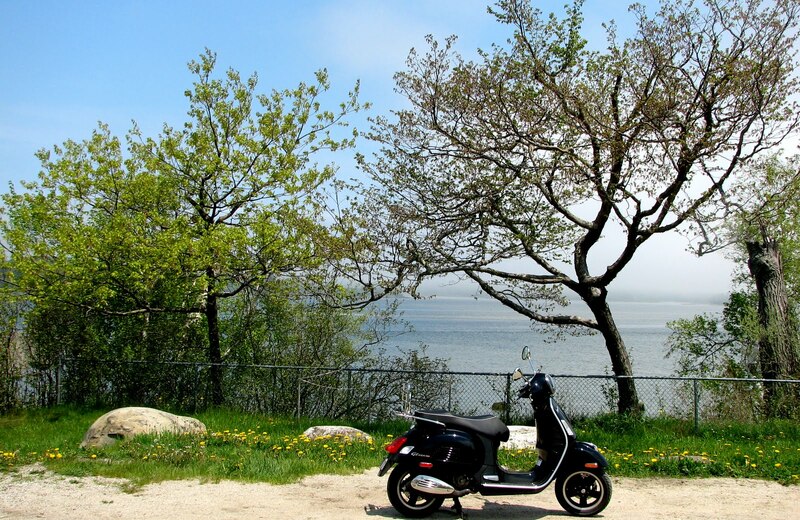 Vespas can be found at trisports.com. I'm not pushing either product, but if a reader buys a ocean-going boat from Steve Arnold, remember me with an invitation to sail! 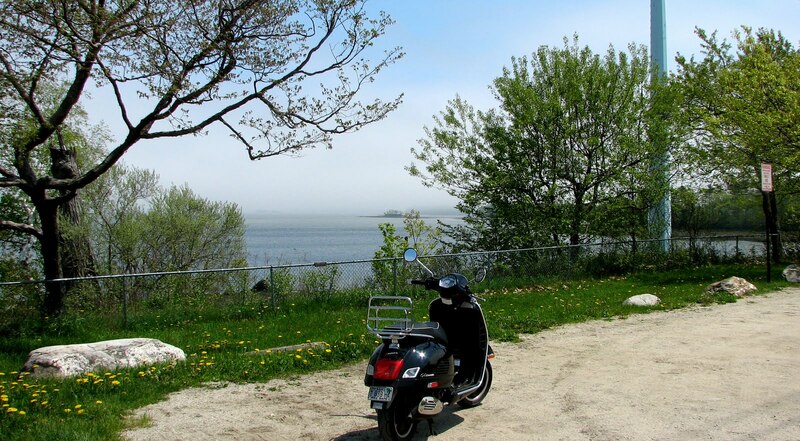 After leaving the boat yard, I rode a few miles south to Cousins Island, several views of which are seen below. Normally, one would see a lot more of the sea from this spot, but the heavy haze which replaced the rain of the past two weeks limits visibility. My wife took nine days off this month to plant her garden. With 36 hours left before her return to work, the sun actually appeared, frightening livestock and small children. With the glare in the sky, many of us wondered if that southern preacher might be right about the end of the world, so unusual was the sight. But clouds quickly hid the sun. I knew it was too good to be true! 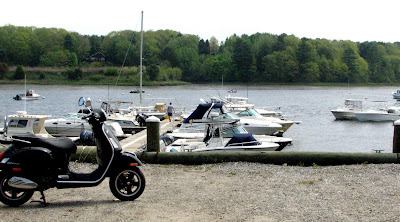 Yarmouth is behind the scooter; a bridge connects the island with the town. The forecast is for some sun in June, and if a pair of days in a row look likely, I'm going to ride down to the Rockland area. A ship carries a boat. If it cannot then it itself is a boat. Thanks, Conchscooter. Now I think I remember hearing that in Navy bootcamp, decades ago; thank you for visiting and for the facts about ships vs. boats.